I’ve been looking for a good dentist for years now, and I finally found one! Well, I’ve been going here forabout a year now and I highly recommend her. She’s amazing! I’ve been looking for a good dentist for years now, and I finally found one! Well, I’ve been going here for about a year now and I highly recommend her. She’samazing! Would 10/10 recommend Dr. Randhawa: hands down is the best dentist I have ever been to, period, full stop. My lastfew dental experiences were somewhat traumatic, and so I went to Dr. Randhawa to have some of that shoddy dental work fixed - and since I haven't been to a dentist in a while, I was pretty sure I had a few new cavities to boot. She and her staff made me feel comfortable, listened attentively, and explained all the procedures simply and thoughtfully. The dental technician (Rosita?) is super personable and made me feel very comfortable. Billing through the front desk staff was super smooth. I will keep returning here; I actually want to stick to a regular cleaning schedule now! You can really tell that Dr. Randhawa loves what she does and is incredibly knowledgeable, cares for her patients and wants to give the best care, and hires superb staff to help her do just that. Would 10/10 recommend Dr. Randhawa: hands down is the best dentist I have ever been to, period, full stop. My last few dental experiences were somewhat traumatic, and so I wentto Dr. Randhawa to have some of that shoddy dental work fixed - and since I haven't been to a dentist in a while, I was pretty sure I had a few new cavities to boot. She and her staff made me feel comfortable, listened attentively, and explained all the procedures simply and thoughtfully. The dental technician (Rosita?) is super personable and made me feel very comfortable. Billing through the front desk staff was super smooth. I will keep returning here; I actually want to stick to a regular cleaning schedule now! You can really tell that Dr. Randhawa loves what she does and is incredibly knowledgeable, cares for her patients and wants to give the best care, and hires superb staff to help her do just that. Dr. Jaskaren Randhawa earned her doctorate in dental medicine from Tufts University School of Dental Medicine, where she was awarded the Presidential Award for Citizenship and Public Service, the Omicron Kappa Upsilon Research Award and was a member of the Honos Civicus Society, Research Honors Society and Massachusetts Dental Society Leadership Institute. Following dental school, she completed her general practice residency at the prestigious Columbia Medical Center/ New York Presbyterian Hospital. At the completion of her residency, she was awarded a U.S. Department of Health HRSA sponsored fellowship to earn her Master’s in Public Health at Columbia University. 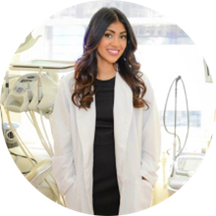 Through her training and experience in comprehensive care, Dr. Randhawa has developed her expertise in advanced restorative, cosmetic, endodontic, and surgical dentistry. She engages in ongoing continuing education and incorporates the newest technology into her daily clinical practice. She is an active member of the American Dental Association, New York County Dental Society, Academy of General Dentistry, and American Academy of Cosmetic Dentistry. Dr. Randhawa truly values her relationship with her patients and spends time to understand their individual expectations, needs and goals. She is dedicated to providing quality, personalized care to improve the oral health of her patients and believes that good oral health is crucial for systemic health. **Please be aware that our practice has a 24 hour cancellation policy fee. Always professional and caring. Great dentist- would recommend to anyone. She is always so helpful and the job done efficiently and effectively. Really friendly and helpful! Was able to take care of a small cavity in no time! Though I do not think getting a crown could ever be considered "fun" she made it as painless as possible. She is very thorough and took extra time to get everything up to her liking. I think she likely saved my tooth. She continually checked in on me throughout every procedure to make sure that I was comfortable. The billing piece was seamless and clear. Front desk staff was super friendly and helpful and the dental assistant was very nice. Dr. Jaskaren and staff was totally professional. I have never been so comfortable at a dentist office before. Dr. Jaskaren made me feel as if we were family. She explained the process, made sure i was comfortable, gave me assurance. ITRUST HER & will definitely be going back for the usual check ups. Exceptional Dental practice, highly recommend. Very nice, helpful, explained out the xrays, options, and scheduled follow ups right away. This was my first time meeting with Dr. Randhawa and she was excellent. She listened and was patient with me as I explained things to her. Great bedside manner, clear explanations and friendly! I broke a crown during my lunch break and Dr. Randhawa was able to see me immediately. She was able to give me a temporary fix until I could work out a permanent solution. She is a lifesaver! I would definitely recommend Dr. Randhawa. Very rarely do you find a dentist as great (and patient!) as Dr. Randhawa. She and her staff are so welcoming and definitely make going to the dentist a lot less intimidating (especially when you need special work done). Convenient location. Highly recommended. Dr. Randawa was incredibly helpful! She explained to me very clearly the kind of procedures I would best benefit from and was able to do everything in one visit! Def worth the visit! This was the first time a dentist took her time to explain everything to me and really try to work with me! Everything was a breeze from the x-rays to the cleaning . Absolutely loved the staff, the doctor, and the location. I am going again! Dr. Jaskaren was, by far, the best dentist I have every been to. The wait was a bit long but she personally apologized multiple times and assured me that she usually saw patients within ten minutes of their arrival. She tookthe time to talk to me about my medical history as well as getting to know who I am as a person. It was nice to feel like more than just another patient they're rushing to get out the door. Her cleaning technique was a bit rough but nothing too painful. After the cleaning was done, she used a camera to take pictures of the cavities I have, putting them on a large TV in the office so I could see exactly where the problem areas are. She laid out how she planned to go about filling them in and suggested breaking up the appointments so it would be more comfortable for me. At the end of the appointment, she even gave me a "goody bag" with a toothbrush, floss, and flouride toothpaste. The atmosphere of the office was friendly and welcoming. The woman behind the front desk even took the time to show me what my insurance covers and what it doesn't which was great and not something any other dentist office has ever done. No surprise bills! I loved my experience here and for the first time am not dreading going to the dentist. Awesome customer service!! From the receptionist to the doctor all make you feel welcoming and that they care about me the patient. Excellent first visit & had a great customer service experience. Very friendly & accommodating staff. Highly recommend this provider. Randhawa is very nice and explained every part of the process I was getting done. This was my first time having/treating a cavity and she explained how she was going to clean the cavity and fill it in great detail. Iappreciate her willingness to communicate what to look out for in the future, how to prevent any further cavities, and what to expect in the follow up. Dr. Randhawa was very professional and thorough. She was pleasant and made me feel comfortable. Dr. Randhawa is really smart, skilled, and professional; and she was great at keeping me informed and at ease throughout my appointment. She did a terrific job on my fillings -- my bite feels very aligned and natural. She addressed concernswith some of my other teeth with measures that were light, but that eliminated discomfort and should provide protection going forward. She assessed and explained my x-rays with specificity and clarity, and I felt confident in her recommendation that I abstain from more invasive treatments. And everything she worked on looked great when she was done. I’m not exaggerating when I say my teeth haven’t looked this good in many years. Also, as others have alluded to, she is kind and patient, and very down to earth. Highly recommend. She is so awesome and really took her time to meet all of my concerns/needs! will be coming back for sure and have already recommended her to many of my collegues!